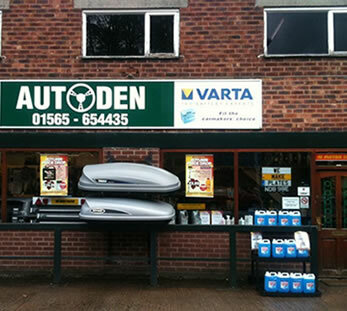 Autoden is a family run business and has been in Knutsford since 1981. We sell a large range of auto spares and accessories, tools, roof bars / boxes and cycle carriers. In the early days we operated out of a small shop on king street, (opposite the Angel pub) until we acquired our current building in mid 1995. The site we now operate from is ideal for our business; whether its being able to park right outside and have us expertly fit the part(s) you have just purchased right there right then, popping in for mechanical or bodywork advice, getting the colour code off your vehicle so we can mix paint for your car or maybe you have booked your car in to be valeted. If we haven’t got what you need or haven’t got the right information we will endeavour to get what you need or find out what you need to know and get you on way, as soon as possible, with as less fuss as possible. I needed some new number plates for my cars mot, made, fitted there and then at Autoden.